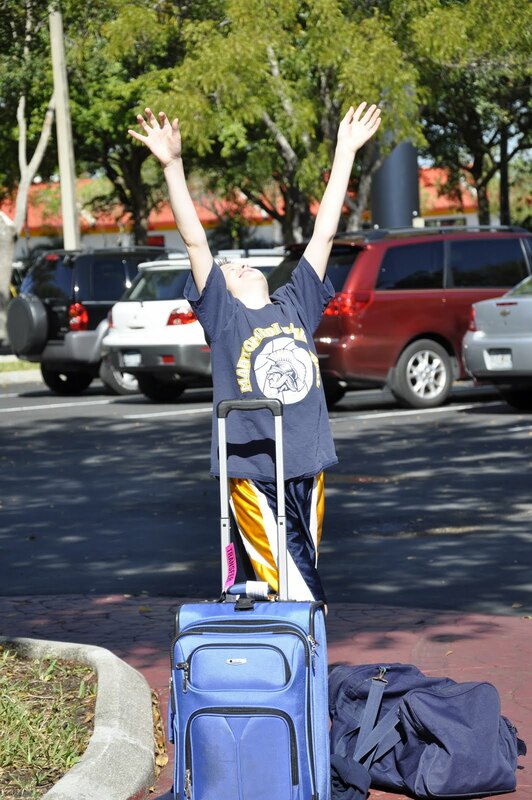 Happy On the Way.com: Sanibel Stories: The Boys are Coming! The Boys are Coming! Sanibel Stories: The Boys are Coming! The Boys are Coming! keeping us abreast of the score. Our future hung in the balance! If they won the game, then they would play again four days later. That would mean that for those of us already in Florida, the females would outnumber the males (well male, poor little Timmy) three to one. That in turn would mean at least four or more days of pastry shops and pedicures, boutique shopping and sunbathing for hours. On the other hand....if the game was a loss....Tim and the two boys would hop in the already packed car and head south. (Molly the dog was already at the kennel for those of you wondering...) It would take them TWENTY-SEVEN hours according to the Garmin, so they would arrive approximately a day later....which would mean the ratio would shift and we would have a vacation of a more "sporty" nature...and a MUCH higher grocery bill. Sadly, in an AGONIZING OVERTIME battle, Andrew and Zach's 2010-11 Basketball Season came to the end. They were sad. But they gathered their emotions and jumped in and headed south for a short little drive to the ocean! As for us...the next morning my Mom and I...we hid our unpolished nails, got pen and paper and thought...how are we going to FEED everybody for 10 days!!!!???? ...because this is what we had to carry up three flights of stairs that morning! As we walked into the store, I thought to myself, "I bet I spend $360 on this trip." I hate when I am wrong. Wrong on the flounder. Wrong on the grocery bill...but just by a little. A lot of groceries you say? "Mom Moment" Alert: She looks so GROWN UP. She's so TALL! When did this HAPPEN? 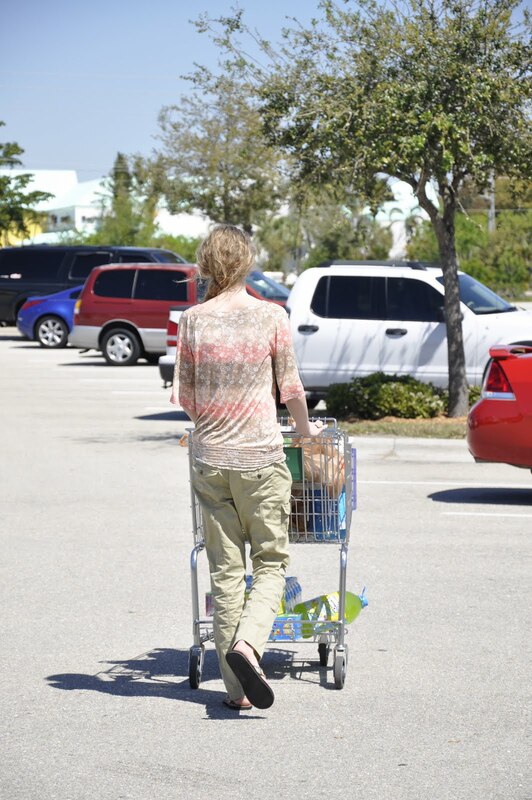 To her complete lack of comprehension, I snapped photos of her as she pushed that loaded cart all through the parking lot. It just struck me then how fast time flies....I think it was yesterday that I would have been pushing that cart, while pulling the other cart, and she would have been hanging over the handlebars. Ok...I'm done now! Ouch. There was momentary confusion when we told them to "get in first." "Pile it on Mom! ".....NOTICE the basketball under Timmy's elbow. It rarely left his sight. She's thinking...."We will never eat all this....even if we can carry it all into the condo....What floor are we on by the way?" "third floor...So who wants to head to the beach?" Driver's perk: NO GROCERIES IN MY LAP....or UNDER MY FEET....OR BEHIND MY HEAD. I know every Mom out there is thinking......"somebody's going to cut their foot!" ...AND YOU ARE ALL CORRECT! Good instincts ladies! This too is a family tradition....or a Timmy tradition anyway! The first five minutes are the most dangerous! ...but finally-- they made it! Look at his eyes...is he happy...or is he crazy? We took a picture of Ashley strolling downtown Philadelphia and thought who is this young woman? So I stole your post a bit, hope you don't mind.